When considering the sale or purchase of land, it's a good idea to review the state's real estate laws. Arkansas codifies a majority of the rules for deeds in Ark. Code 18-12 (2012). Arkansas does not restrict ownership of real estate to US citizens ( 18-11-101). The term "real estate" includes all lands, tenements, and hereditaments on the specific piece of land ( 18-12-101). Arkansas does not include a specific form for deeds, but identifies the words and actions associated with warranty deeds. By including the words "grant, bargain, and sell" in the granting clause, the deed contains an express covenant to the buyer (grantee), "his or her heirs, and assigns that the grantor is seized of an indefeasible estate in fee simple, free from encumbrance done or suffered from the grantor, except rents or services that may be expressly reserved by the deed, as also for the quiet enjoyment thereof against the grantor, his or her heirs, and assigns and from the claim and demand of all other persons whatever, unless limited by express words in the deed"( 18-12-102). Be aware that "neither the statutory nor general express covenant of warranty against encumbrances shall be held to cover any taxes or assessments of any improvement district of any kind, whether formed under general statutes authorizing the assessment of lands for local improvements of any kind or whether the improvement district is formed by public or private act of the General Assembly. The lien for any such local assessment or tax shall run with the land and be assumed by the grantee, and the grantee shall pay any and all installments of the tax or assessment becoming due after the execution and delivery of the deed, unless otherwise expressly provided" ( 18-12-102). As a clarification, the term "heirs," is not necessary to "create or convey an estate in fee simple, but all deeds shall be construed to convey a complete estate of inheritance in fee simple unless expressly limited by appropriate words in the deed"
When two or more people become co-owners of real property, they must define, in the body of the deed, how they intend to hold title. Arkansas law dictates that for every "interest in real estate granted or devised to two (2) or more persons, other than executors and trustees as such, shall be in tenancy in common unless expressly declared in the grant or devise to be a joint tenancy"
A difference arises if the grantees want survivorship rights, which means that if one co-owner dies while sharing ownership rights, the survivor(s) gain the deceased owner's portion without the need for probate. This vesting option is available to all co-owners, regardless of their relationship to one another, simply by identifying themselves as joint tenants with right of survivorship ( 18-12-106). For example, "A grants and conveys to B and C as joint tenants with right of survivorship..."
When a married couple prepares to sell real estate, they need to relinquish their spousal rights of dower or curtesy. Dower represents the wife's rights in her husband's property and curtesy is the husband's rights in the wife's property. The simplest way is to sign the deed as a grantor (if listed as a record owner) or a spouse ( 18-12-402). In situations where the real estate conveyed is identified as homestead property, the deed is not valid "unless his or her spouse joins in the execution of the instrument, or conveys by separate document, and acknowledges it" ( 18-12-403). Execution is the act of signing a real estate deed. Arkansas requires two disinterested witnesses to be present when executing a deed, one of whom may be the notary or other officer certified to administer oaths ( 16-47-106), ( 18-12-104). The notary will be present when the deed is executed because all "deeds and other instruments in writing for the conveyance of any real estate, or by which any real estate may be affected in law or equity, shall be proven or duly acknowledged in conformity with the provisions of this act before they or any of them shall be admitted to record" ( 18-12-201). While the statutory information about warranty deeds does not include content requirements, the recording laws offer some useful details. All documents must be printed on 8" x 11" paper, with a 2" top margin on the first page, a 2" bottom margin on the last page, and " margin on the top, bottom, left, and right otherwise. The deed must have a title that clearly explains its purpose -- "Warranty Deed" or "Quitclaim Deed," and the full names of all parties (grantors and grantees) ( 14-15-402). The deed must also contain, on the first page, a statement that includes the full name and address of the individual who prepared the form. The statement must start with the phrase "This instrument was prepared by..." ( 14-15-403). Once all the requirements are fulfilled, the deed is ready to record. 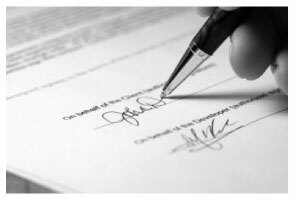 Arkansas law requires the recording of all real estate deeds. Submit the completed form to the recorder's office for the county where the land is located. Recording is important because it provides constructive notice to "all persons from the time the instrument is filed for record in the office of the county recorder of the proper county" ( 14-15-404). Before entering the deed into the public records, the recorder certifies the document by marking it with the day, month, and year of receipt and the book and page reference for where the document is recorded in the files (14-15-412). Arkansas follows a notice recording act, which means that, in general, the bona fide purchaser, or "person with the most recent valid claim, and who purchased without notice of an earlier, unrecorded claim, has priority" (BLACK'S LAW DICTIONARY 8th ed., 2004). For example, A conveys to B, who, in violation of Arkansas law, fails to record the transaction. A then conveys the same land to C, who records the deed. C, as the person who recorded AND the more recent buyer, keeps the land and B loses it. DAVID K. said: Good so far could use more examples for each section of info. needed. ex. (parcel and alt.ID info where to find and etc. #2 more examples. If it was not for the red print examples helping to fill the form out I could have downloaded free forms, the examples are what made me choose your form !